How to choose the suitable oil spill pallet and spill platform? EPA 40CFR264.175, as EPA's EPA, must contain 10% less leakage than the sum of individual storage and the total volume of all storage containers as a leak-proof, secondary containment device, spill pallet, and spill platform. , The two comparison of the larger. Four 55-gallon containers, four 55-gallon plus 220-gallons, 220-gallon 10-gallon, 22-gallon, 55-gallon, and 55-gallon single drums, respectively, are on top, US EPA regulations, spill Le pallet and spill spill platform spill capacity must be greater than 55 gallons. Some people say that my leak is a little bit, not so much, do not need such a large volume of leakage (this pallet to the height can be as low as possible, then the cost is low). But we need to take preventive measures, in extreme cases, all things may leak finished, but this is unlikely, resulting in significant increase in product costs (pallet spill volume, the pallet size needs to be large). With a probability of 10% more appropriate. It is entirely possible for a single container to leak completely. Compare, which is big with that, this is very reasonable, both effective prevention of possible leakage, it will not let the product manufacturing costs increase a lot. 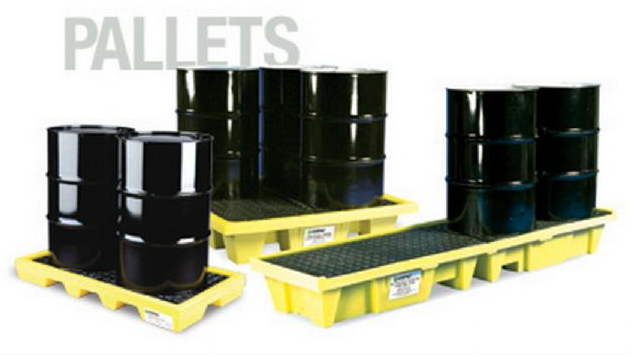 15, consider the selected spill pallet and spill leakage platform belongs to the overall quality of the brand (the overall mechanical strength, spill leakage volume, whether the non-slip grille safety fixed but very easy to remove, pallet design is reasonable, whether oil-resistant chemical materials Corrosion, color, pallet is sufficient security), whether through the authority of the detection, compliance with the standards are professional, to choose the brand in the industry's status, product life. For example, the height of the pallet should be 4 weeks higher than the inside of the grille, so the oil drum is not easy to slide out. Yellow color is a warning color, very appropriate. Black ugly, not eye-catching. Picky people pay attention to this.